Why the Ginger Lily has that name is a mystery. It’s not related to the spice and doesn’t have its taste or fragrance. Still, this delightful flower – whose more formal name is Hedychium – deserves all the attention it gets. A native of the Himalayas, the Ginger Lily has been grown successfully in many other parts of the world. It can be found all the way from the hills of Hawaii to a neighbor’s garden in Florida. One type, the Hedychium coronarium is the national flower of Cuba. It is also common in Brazil. While not so hardy as their cousins, the Asiatics, they can be grown in zones 7-11 without difficulty. Colder climates are possible, but the lower the number the less likely you will succeed with this flowering plant that has adapted to tropical climates. The flowers resemble a hyacinth and come in a variety of delicate pastel shades, as well as white. Orange and yellow are popular varieties, and there are even some deeper shades. 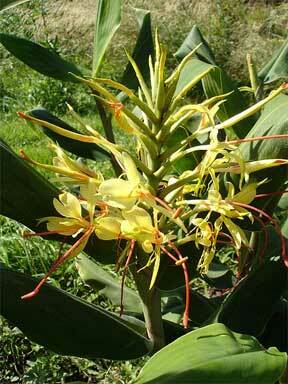 The Hedychium greenii, for example, sports orange-scarlet petals, the Hedychium gardnerianum bloom is a rich yellow. The Hedychium yunnanense from the Yunnan province in China sports white blossoms that have a deep yellow and red throat. They’re unlike their Asian cousins in another way. They offer a rich, spicy fragrance that adds a delightful aroma to the garden or home. Inside, they’re best grown in a hothouse, but it is possible to grow a well-cared for Ginger Lily in a pot inside the home. In either case, they will need lots of sunshine, like most lilies. Some species of the genus will tolerate partial shade, but the more hours of sun the better for this flowering plant. If you’re seeking some that lean more toward shade tolerance, try the Curcuma petiolata or Curcuma elata. For something on the tall side, look into an Shell Ginger (Alpinia zerumbet). These monsters get up to eight feet high, but they do require mild winters if they’re to produce their large pink and white flowers. For those who prefer a shorter plant, which are generally easier to care for, try the Mauve Dancing Ladies (Globba winitii). They reach only about two feet. Whichever you choose, your Ginger Lily will also need moist, well-draining soil, but little else. A bit of fertilizer won’t do any harm, but if some good-quality earth is prepared properly it’s unnecessary. Like most lily species, the leaves and stalk will die off during the cold season if the temperature dips below tropical temperatures. Most will come back year after year, however, provided they’re not subject to frost heave that breaks the bulb. Once the foliage dies, trim back the dead leaves and stalk at ground level. Take care not to do it too early. Any green portion of the leaf remaining is still making sugar that is stored in the bulb. 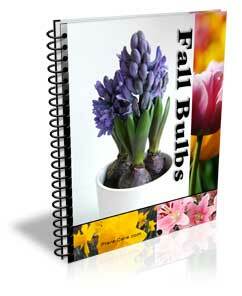 It is that nutrient that helps the bulb overwinter. To minimize frost damage, a good mulch laid over the area around the stalk will help.